This tense, fast-paced tale of delinquency, rivalry and teamwork will amaze and amuse young adults everywhere. 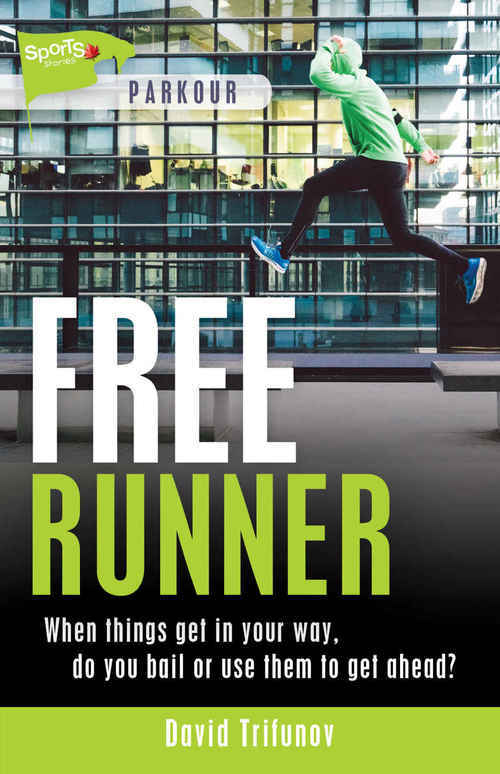 FREERUNNER is the story of Patrick, also called Tricky, in Ottawa. He gets into trouble at the mall. Yes, that kind of trouble. While trying to escape from security guards and police, he shows a talent for running and crossing obstacles. So -- inevitably he is caught -- the cop, Constable Jack, offers him a chance. If he learns to run parkour, he stays free. Parkour is the term for running over city obstacles, vaulting, hopping, rolling, without getting hurt. You've probably seen it on TV in stunts, and 'epic fails' in silly clips. Get it right and suddenly the young lad is an athlete. Training has its downsides -- a well-off lad Jayden who's been doing it longer and resents the intruder. But parkour definitely has a good side, in the form of smart, skilled girl gymnast and runner, Parker. Kids will read this book and be inspired. The author David Trifunov has been an award-winning journalist, and has written two other books of sport and challenge for young adult readers, called Ice Time and Snow Soccer. While FREERUNNER is novella length, it focuses on Tricky and his newfound sport and classmates rather than diverge into other areas. Have fun.